Old Republic International Corporation is one of the nation's largest public insurance organizations. The company began in 1923 and serves many organizations. Our truck accident lawyers are interested in Old Republic because they insure many big and small trucking companies around the country. As you will see below, they are the defendants' insurance company in many truck accident injury and wrongful death cases. This is a huge company that is publically traded on the New York Stock Exchange. Its price has doubled in the last five years. This Chicago-based conglomerate has more than 128 corporate entities, with 27 of them being insurance companies. This company underwrites coverage and provide risk management services for a wide range of coverages in liability and property. They are also knee deep in mortgage guaranty, title and life and health insurance. Workers compensation lawyers in Maryland often see Old Republic as a comp insurance provider. Republic Insured Credit Services, Inc. In addition to the insurance group, Old Republic also has a mortgage guaranty group, title insurance group, and corporate/other operations. 2016, California: $800,000 Settlement. A 37-year-old man is traveling on the interstate when a semi-tractor and trailer, being driving by defendant, is traveling in the adjacent lane. Defendant attempts to change lanes into plaintiff's lane, however collides with him. The impact causes the man's car to roll over, landing on its roof. As a result, the plaintiff sustains compression fractures and disc bulges in his spine, along with a concussion. Plaintiff argues that the defendant failed to see him and also failed to properly activate his turn signal, while defendant driver argues that there were no vehicles in the lane before making the lane change and that he did activate his turn signal. Defendant was insured by Old Republic Insurance, who agreed to settle the case for $800,000 during a settlement conference. 2016, California: $2,040,000 Verdict. A 71-year old woman is traveling on the bus when the bus driver, who was new to driving the route and had never made the stops before, attempts to pull over where the passenger plaintiff instructed him too. Plaintiff, using a power scooter as she is unable to walk, begins to get off the bus using the disabled passenger ramp. When one of her wheels hits the ground, the scooter tips over and the woman falls, injuring her neck and right shoulder. She claims that the driver, being unfamiliar with the bus stop, pulled too far to the right and passed the stop, so when he lowered the ramp the ground was uneven and soft and without traction. The bus driver alleges the surface where he stopped was made of compacted gravel and dirt and that it was very near to the designated stop. Old Republic International Corporation insured the bus. A jury found the bus company 60% liable for the woman's injuries, and the woman 40% liable. They awarded her $2,040,000, but this was reduced to $1,224,000 since the plaintiff was found 40% negligent. 2016, Illinois: $6,000,000 Settlement. Plaintiff, a 57-year-old woman, is entering a supermarket when she trips on a floor mat and falls to the ground. She hits her head on a handrail, and as a result, fractures her neck. She is now paralyzed from the chest down. She sues the store, arguing that they placed a defective floor mat and created a dangerous condition, which was unable to be seen due to the automatic swinging door. Defendants argue that a curl on the mat did not exist during the accident, but even if it did, it was obvious to all those who passed through the entrance. The supermarket's insurer, Old Republic, and their excess insurer, American International, settle the case for $6,000,000. 2016, New York: $313,500 Verdict. An 80-year-old woman is walking on the sidewalk. She reaches an intersection, and begins to cross the street. However, a truck, completing a left turn, strikes her. The woman injures her hand, head, hip, and shoulder. She sues the driver of the truck and the owner, as she alleges she was walking in the crosswalk and had the right of way. The defendants argue their truck did not hit her, but that she just fell. Additionally, they argue she was not in a crosswalk. The driver and truck company were insured by Old Republic International Corporation. A jury found that the defendants were 33% liable and that the woman was 57% liable for her injuries. Therefore, they awarded her $313,500 (33% of the damages). 2015, New York: $1,750,000 Settlement. A young woman is traveling in her vehicle when she is rear-ended by defendant's vehicle. The collision pushes her into the rear of the vehicle in front of her, and she injures her back, neck, and shoulder. The woman sues the defendant and her employer, both insured by Old Republic International, and the defendants argue that the driver could not have avoided the collision because the plaintiff stopped suddenly to avoid a vehicle exiting a parking lot. During a pre-trial settlement conference, the parties settled, with Old Republic paying $1.75 million of its $2 million policy coverage. 2014, Oklahoma: $410,000 Settlement. A minor child is traveling in her parent's vehicle when a truck collides with them. Her parents bring a claim against the truck driver's employer, arguing that the driver drove the truck negligently. The company's insurer agreed to pay $385,000 while Old Republic Insurance, insurer of the leasing company for the truck, agreed to pay $25,000 in settlement. 2014, Wisconsin: $1,235,000 Settlement. Two minor children are in a minivan being driven by their mother. They come to a stop due to traffic, however a utility truck traveling behind them fails to stop and collides with their vehicle. One of the children sustains fractures to her tibia and fibula, and the other sustains injuries to her back and jaw. The mother and her children file a claim against Old Republic Insurance, who insured the driver and the company he was working for, alleging negligence in the operation of the truck. The parties settled, with one minor child receiving $1,135,000 and the other receiving $100,000. 2013, Texas: $5,000,000 Settlement. A 55-year-old construction mechanic is driving a construction truck when a tractor-trailer, traveling in the opposite direction, loses control of his vehicle and collides with him. He sustains a mid-shaft femur fracture, a left femoral fracture with hematoma, a left patella fracture, and right tibia and fibula fractures. The man was hospitalized for a month, underwent several surgeries, and continues to have difficulty walking. The plaintiff alleges that the defendant driver was talking on his cell phone at the time, and that he had been working for more than twelve hours. Old Republic Insurance insured the defendant truck driver and agreed to settle, along with the excess insurer, for $5,000,000 prior to trial. 2012, Missouri: $3,300,000 Verdict. Decedent plaintiff is driving when defendant's truck strikes him head-on and kills him. The truck driver had attempted to brake to stop for a vehicle waiting to execute a left turn in front of him, but began to brake too late and skid into oncoming traffic where he struck the plaintiff's vehicle. Old Republic insured the tractor-trailer driven by defendant, and agreed to settle for $3,050,000 while the rest of the settlement included portions from the other insurers and the driver. 2012, Louisiana: $41,480 Verdict. Plaintiff is driving his vehicle when he is struck by a tractor trailer. The tractor trailer, driven and owned by defendants, was attempting to back the tractor-trailer up into a shopping center driveway. Before the collision, plaintiff stops his vehicle and honks his horn, while attempting to drive around the truck. As a result of the collision, his cervical and lumbar spine are strained. He files a claim against the driver and truck rental company, Old Republic Insurance Company, and the defendant's dispute who was at fault for the accident and the nature of the plaintiff's injuries. A judge awarded the plaintiff $31,500 for general damages and $9,980 for medical expenses against Old Republic Insurance Company, but then reduced the award to $31,110 due to the plaintiff's 25% comparative fault. Do judges give as much money as jurors do? It depends on the jurisdiction but we almost always prefer a jury trial to bench trial. 2011, Washington: $525,000 Settlement. A 49-year-old man is driving his Toyota 4Runner when a semi-tractor trailer, driven by defendant, attempts to make a left-hand turn onto the same road. However, defendant driver cuts the corner too lose, and the left side of his trailer collides with the front side of plaintiff's vehicle. Both of the man's knees strike the console, and he hurts his lower back. He sues the driver, alleging negligence for inattention and also argues that the street was closed to trucks, but the truck driver took the route anyways as a short cut. During a second mediation session, the truck's insurer, Old Republic, agreed to settle the case for $525,000. 2010, California: $4,100,000 Settlement. A 49-year-old woman is driving her vehicle when a truck, operated by defendants and insured by Old Republic, is traveling in the opposite direction. The truck then crosses the center of the road and strikes the plaintiff's vehicle. The driver argues that he struck the plaintiff's vehicle to avoid striking another vehicle attempting to make a left turn from the center lane, and that he was driving under the speed limit at the time the accident occurred. A police report found that the vehicle turning from the center lane was the sole cause of the accident. As a result, the plaintiff had a right tibia-fibular fracture, a left patella fracture, and bilateral calcaneus and cuboid fractures requiring surgeries. Two years later, she has bilateral above-the-knee amputations, which she claims are related to the incident. The parties settle for the $4 million policy limits, in addition to the $100,000 settlement the plaintiff made with the driver of the other vehicle. 2010, California: $1,850,000 Settlement. A woman is traveling with her minor son and minor daughter as passengers. A milk truck is traveling on a road that intersects the woman's path of travel, but fails to stop. The woman's car goes under the trailer, ripping off the top of her vehicle. She is transported to the hospital but dies shortly after. 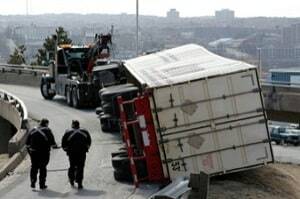 Her Estate brings a claim on her behalf, alleging that the truck should not have attempted to cross the intersection due to the weather conditions. The driver argues that he rolled down his window to check for traffic, and then attempted to cross the intersection even though he was unable to see. The two insurers for the trucking company, National Union Fire Insurance and Old Republic Insurance Company, agreed to settle the case for $1,850,000. 2010, Missouri: $900,000 Verdict. A 35-year-old man is waiting for a bus on his way to work when a tractor-trailer, insured by Old Republic Insurance, drives by. The trailer detaches, strikes a tree, and then hits the man. The collision rips some skin off of the man's leg, and he is hospitalized for three days. A jury awards him $900,000 during trial. 2010, New Jersey: $4,000,000 Settlement. A 28-year-old is riding his motorcycle when a truck executes a left turn in front of him. The motorcycle driver is unable to stop, hits the truck, and is thrown off his motorcycle. The man has many surgeries, including screw placements and plates in his pelvis, open reduction and internal fixation of mandible fractures, resection of fragments in his left big toe, and other screw placements. He lost two teeth as well. After being in the hospital for over a week, he is transferred to an in-patient rehabilitation facility for ten days. He settles with Old Republic Insurance Company, the insurer of the truck driver and company, for $4,000,000 during mediation. 2009, Pennsylvania: $4,200,000 Settlement. A 35-year-old is at work and operating a stick boom ariel lift. While operating it, he accidently touches the drive/steer controller, which makes the lift bolt forward. The man is then pinned between a steel beam and had the control panel pushed into his chest. The lift allegedly rams into his midsection multiple times, until another foreman hits the emergency stop on the machine. The man is in a coma for over a month, diagnosed with spinal fractures, a major colon injury, and deep vein thrombosis. When he is discharged, he is only able to move with help. He sues the manufacturers of the machine, and the company who leased the lift as well. The leasing company was insured by Old Republic Insurance. Both defendants settled the case for $4,200,000 prior to trial. 2009, Georgia: $100,722 Verdict. Plaintiff is stopped in traffic on the Interstate when defendant's truck strikes him in the rear. The company the truck driver was working for was insured by Old Republic Insurance, and the court ordered that the man was to recover $100,722.59 from the company and the insurance company. 2009, Virginia: $50,000 Settlement. Plaintiff is driving a truck along a two-way road when defendant, traveling in the opposite direction, drifts across the center line and strikes his vehicle. The man has significant orthopedic injuries as a result. Defendant driver was uninsured, and driving a rental car insured by Old Republic. Old Republic offered their policy limits of $25,000 and GEICO, the man's personal liability carrier, also offered $25,000. The parties settled for the combined total of $50,000. 2008, New Jersey: $550,000 Verdict. A 28-year-old is shopping when a vertical pole that is attached to her shopping cart strikes a hanging sign. The sign is knocked down, and strikes the woman on the head, knocking her over. She undergoes physical therapy for three months due to a spinal herniation, and has a discectomy followed by pain management treatments. She brings a claim against the store, arguing that they hung the sign "dangerously low" causing her accident. The store was insured by Old Republic Insurance, and summary judgment was granted for plaintiff. She was awarded $550,000 in damages. At Miller and Zois, our attorneys have handled many truck accident serious injury and wrongful death cases. Our focus is Maryland but we handle serious truck accident injury and death cases throughout the United States. We have a history of getting results which you can see by looking clicking on the verdicts and settlements bar at the top of this page. We also know how to put pressure on insurance companies like Old Republic to maximize the value of these cases. If you have been suffered after a truck accident, please call us at 800-553-8082 or get a free evaluation online.